Can Conservatives Stop Defending Slavery? Cliven Bundy isn’t the first conservative to defend slavery, but he may be one of the first condemned by fellow conservatives for doing so. Does this mean conservatives are ready to stop defending slavery, if only for the sake of their political future? January 2007: Virginia Delegate Frank Hargrove told the Daily Progress of Charlottesville that blacks should “get over” slavery. January 2007: Conservative blogger Mark Graber argued that Dred Scott v. Sanford was rightly decided. March 2008: Pat Buchanan wrote that blacks should be “grateful” for slavery. September 2011: South Carolina Senate President, Republican Glenn McDonnell came under fire after pictures surface of him at a Republican event, dressed in a Confederate army uniform, with two African Americans dressed as slaves. McDonnell, a Civil War re-enactor who has been photographed in Confederate garb before, defended the event and the photos. 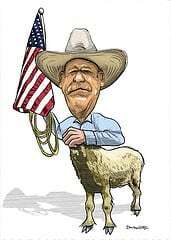 November 2010: Rep. Steve King (R, Iowa) said the USDA’s settlement with black farmers is “slavery reparations” cooked up by a “very, very urban” President Barack Obama. January 2011: Glenn Beck defended the “three-fifths clause” of the U.S. constitution on his Fox News show. October 2012: Arkansas state Rep. John Hubbard wrote in his self-published book, “Letters To The Editor: Confessions Of A Frustrated Conservative,” that slavery “may have actually been a blessing in disguise” for African-Americans. June 2013: Virginia candidate for lieutenant governor E. W. Jackson said government programs had done more harm to black families than slavery. October 2013: Nevada Republican Assemblyman Jim Wheeler said that he would vote to reinstate slavery, if that’s what his constituents wanted. But unlike the conservatives above, Bundy’s statements were met with — albeit qualified, lukewarm, and reluctant — condemnation from some of the very same conservatives who were his enthusiastic supporters days earlier. But “playing the race card” doesn’t work so well for conservatives anymore. The GOP made itself the party of white people. It has grown whiter still by re-drawing district lines around huge chunks of their base, while systematically concentrating Democratic voters — especially African-Americans — into as few districts as possible. The strategy has created a huge demographic problem for the GOP. While the U.S. population is growing more diverse, and the electorate along with it, Republican districts are isolated from demographic changes. Republicans in Congress still represent mostly white districts. As a result, Republicans aren’t used to talking to — or listening to — non-white voters, because for so long they haven’t had to do so to win. And maybe they won’t have to for a long time, if Republicans limit themselves to just holding the House and maybe retaking the Senate. But Republicans want to win national elections in the future, they’re going to have to learn. Not defending slavery anymore is a good place to start.